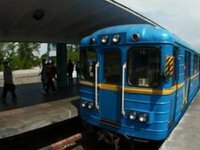 China Railway International Group has confirmed the completion of the preliminary feasibility study for a project to build the fourth subway line in Kyiv, Deputy Head of the Kyiv City Administration Dmytro Davtyan has said. "... Together with representatives of the Ukrainian delegation, I met with the leadership of China Railway International Group. I received an official letter from the head of the company's board, which officially confirmed the completion of the preliminary feasibility study for the construction of the fourth subway line," he wrote on his Facebook page on Thursday. According to him, the Chinese company also provided a pre-feasibility study, which will be presented in Kyiv. Earlier Kyiv City Mayor Vitali Klitschko said that the construction of the fourth subway line will begin after the completion of the Podilsko-Voskresensky Bridge and will last five years. The cost of construction is estimated at $2 billion. At the same time, it is proposed to provide 85% of the project's projected cost through a loan from Chinese financial institutions.